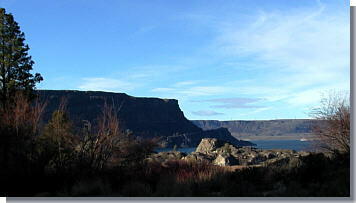 Set in the Southern Grand Coulee Wall, Near Steamboat Rock State Park, Northrup Canyon is a Nature Lovers Paradise. Countless Species of Flora and Fauna inhabit this Pristine Canyon. Settled by the Northrup Family in the Late 1800's... this canyon has been a shelter for countless natives and pioneers over the centuries. You Can still find their old Cabin along the trail to the top of the canyon. An old covered Wagon Trail is Rutted along the North Wall. This Wagon Trail was a passage route cutting across the center of the Grand Coulee and up Barker Canyon on the other side. At the Top of the Canyon you will find a beautiful 5 acre stream fed lake, which is stocked with some of the largest trout around. Looking out of the Canyon into the Coulee. Steamboat Rock and Banks Lake are in the Distance. From Mid November through Mid March, Northrup Canyon has become a haven for Bald Eagles. 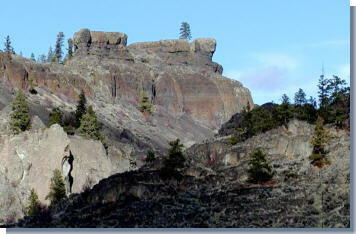 They Roost in the Canyon amongst the Sheer Rock Walls and multitude of Pine and Fir Trees. is in the afternoon around 2:00 pm through Dusk. Interpretive Forums, Theatre, Live Entertainment, and Interpretive Bus Tours of the Area Eagle Sites & Habitat, Plus Viewing tours at Northrup Canyon make this an Entertaining and Educational weekend Event bird and Nature Lovers Everywhere. Don't forget your camera, digicam, Telescope, or recorder.... this Canyon Setting makes for some wonderful Nature Pictures and experience. Great Lake Missoula Ice-Age floods over 10,000 years ago. 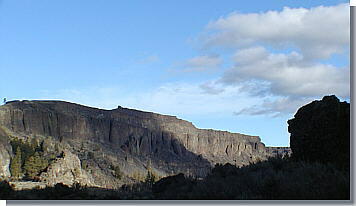 Northrup Canyon is one of the GCD Area's Long Kept Secrets. From Grand Coulee Dam Drive approx 7 miles on State Hwy 155 South Bound to Mile Marker 19. Go Left up the Improved County Road for 1/2 mile and Park at the Eagle View Site Lot. From there you can walk all up, down and all around the canyon. There is an Equestrian Area for Trail Riding and for Camping as well just before the View site Parking Area.